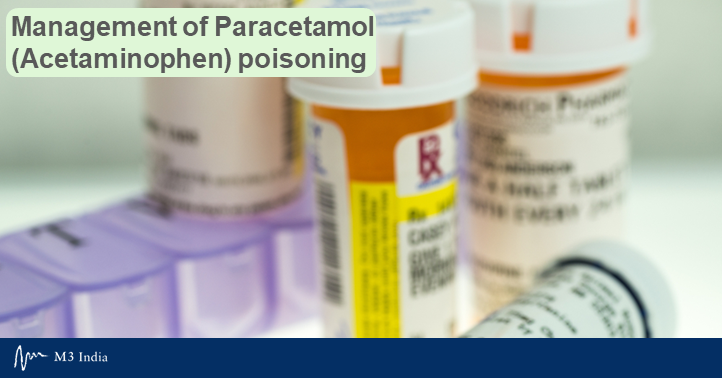 Paracetamol overdose can be accidental or on purpose and it usually takes between 24 to 72 hours after consumption for the signs and symptoms of acetaminophen poisoning to manifest. The dose of acetaminophen which can be safely given within 8 hours is 200 mg/kg for children below 6 years, and 200 mg/kg or 10 g in adults, after which toxicity can occur. Paracetamol overdose can be accidental or on purpose and it usually takes between 24 to 72 hours after consumption for the signs and symptoms of acetaminophen poisoning to manifest. In managing paracetamol poisoning, the time at which the patient is seen after paracetamol intake is considered important. On the basis of the clinical status of the overdosed patient, treatment options for paracetamol poisoning may include inhibiting the absorption of paracetamol from the gastrointestinal tract (decontamination) and giving an antidote (N-Acetyl Cysteine) to inhibit the formation of, or to neutralize metabolites (Chiew AL et al, 2018). The outcomes of acetaminophen intoxication are generally good when N-Acetyl Cysteine is given timely within the first 10 hours. In a study of 333 cases of acetaminophen overdose, 4 percent of patients showed hepatotoxicity with a mortality rate of less than 1 percent when N-Acetyl Cysteine was given quickly (Kumar RD, Premnath U, 2017). Gastrointestinal decontamination is useful in patients who have taken a toxic dose of acetaminophen of more than 7.5 grams. In order to reduce the absorption, in the first 4 hours after the intake of paracetamol, activated charcoal can be given to the patients in a dose of 1 g/kg up to a maximum dose of 50 g. A larger reduction in serum acetaminophen levels, and therefore less toxicity is seen when treating patients with activated charcoal. Gastric lavage and induced emesis also restrict the absorption of acetaminophen after overdose but they are not as effective as activated charcoal. Pregnant women, people on prolonged fasting, chronic alcoholic patients or patients with chronic isoniazid use are at greater risk of acetaminophen poisoning since their threshold is lower at 4 g or 100 mg/kg within a 24 hour period. N-Acetyl Cysteine lowers the risk of mortality and serious hepatotoxicity and is therefore given early within 8 hours after acetaminophen intake with an aim to prevent an increase in alanine aminotransferase levels. However, in spite of giving N-Acetyl Cysteine early, hepatotoxicity may still be seen if the dose of acetaminophen is too much i.e. more than 30 g or if the serum concentration is >500 mg/L. N-Acetyl Cysteine can be given via with a 20 hour intravenous (IV) protocol and/or the 72-hour oral protocol. Both the IV and oral routes are useful, effective and widely accepted with very little differences but the IV route is preferred in patients having vomiting, hepatic failure, or in patients who cannot take oral drugs due to pancreatitis, bowel ileus or obstruction, bowel injury etc. 10 to 20 percent of patients treated with IV N-Acetyl Cysteine can develop hypersensitivity reactions. Urticaria patients can be given norepinephrine, diphenhydramine and a glucocorticoid and their infusion should be discontinued for some time. IV infusion should be stopped in patients who develop hypotension and/or other signs of systemic anaphylaxis and they should get treatment for anaphylaxis. Oral N–Acetyl Cysteine therapy may then be considered since it will be tolerated by most of the patients. In case of nausea and in patients that are vomiting before receiving oral N-Acetyl Cysteine, an antiemetic should be given to the patients before starting oral N-Acetyl Cysteine. The N-Acetyl Cysteine dose can be repeated if the patient has vomited within an hour after taking the dose of N-Acetyl Cysteine. If the vomiting continues even after giving oral anti-emetics, then N-Acetyl Cysteine should be given intravenously. A loading dose of N-Acetyl Cysteine is given initially as 150 mg/kg over 15 to 60 minutes diluted in 200 ml. After this, a 12.5 mg/kg dose diluted in 500 ml is given every hour for 4 hours. The final dose is given at a rate of 6.25 mg/kg every hour by diluting in 1000 ml over 16 hours (total of 100 mg/kg). In children <20 kg, the 150mg/kg is loaded by dissolving in 3ml/kg diluents for one hour, followed by 4 hours at 50mg/kg in 7 ml/kg diluent. Final doses are given by diluting 100 mg/kg in 14 ml/kg over 16 hours. In cases where the patient shows hepatotoxicity and if they give a history of taking a large amount of acetaminophen, their duration of treatment can be extended. In children between 20-40 kg bodyweight, the loading dose is given at 150mg/kg diluted in 100 ml for 1 hour, and for the next four hours, N-Acetyl Cysteine is given at a dose of 50 mg/kg /hour diluted in 250 ml, followed by the next 16 hours where it is given at a dose of 100mg/kg diluted in 500ml. According to this treatment protocol, a total amount of 300 mg/kg is delivered over a time frame of 20 to 21 hours. A simplified 20 h IV protocol is suggested in which a two-bag regimen can be used for treatment if allergic anaphylactic reactions occur during the standard 3 bag treatment. In this regimen IV N-Acetyl Cysteine at a dose of 200 mg/kg is given for 4 hours, and then a dose of 100 mg/kg is given for 16 hours. Patients treated with a modified two-bag regimen have fewer non allergic anaphylactic reactions. For more than 30 years, the 72 hour oral (PO) dosing protocol for N-acetylcysteine treatment has been used successfully. It consists of giving N-Acetyl Cysteine as a loading dose of 140 mg/ kg PO, followed by a dose of 70 mg/kg PO every four hours for a total of 17 doses irrespective of whether the patient has been treated with activated charcoal or not. Hepatotoxicity is seen in less than 10 percent of the patients when treated within 8 hours after acetaminophen intake, and if the treatment is delayed up to 16 hours, then the risk of hepatotoxicity increases to nearly 40 percent. The other protocol for N-Acetyl Cysteine administration involve a loading dose of 100 mg/kg over two hours, and then for 10 hours a dose of 200 mg/kg is given. This protocol has shown lesser adverse effects in comparison with the 20-hour protocol. Assessment of aminotransferases is not needed if N-Acetyl Cysteine is given within 8 hours of acetaminophen ingestion. For guiding the treatment duration and the need for its continuation, measuring serum acetaminophen is also recommended after N-Acetyl Cysteine treatment is completed. In cases of hepatic failure, since N-Acetyl Cysteine improves the hepatic microcirculatory function, it should be definitely given. In pregnancy, N-Acetyl Cysteine treatment is indicated when the serum transaminase concentration is more than 50 IU/L or the serum acetaminophen concentration is greater than 20 mcg/mL. There is no difference in the dosing and the duration of treatment in cases of pregnancy. Pregnant women with acetaminophen overdose may even show an increased risk of miscarriage and fetal death if the duration of N-Acetyl Cysteine administration increases.